So this year’s Miss Universe pageant was held at the Mandalay Bay here in Las Vegas and I was privileged to be the dj for the backstage gifting room. I met many good people, took pics, and simply had a great time. I’m also glad Miss Mexico won, success! 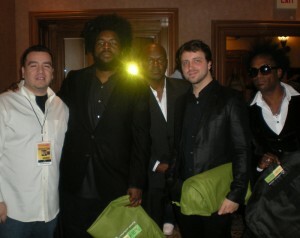 I’m waiting on pics to be emailed to me but in the meanwhile, here is one I took with Quest Love and the Roots along with a small video clip.